I had to put off hunting season.... just cause! Ooohh man. 2PM hatches... no fishermen around... dem fishies sense that the happyeasyfoodtimez are coming to a close. I hunted this guy. It was one of those ‘lost count’ days. It’s a poor pick... but dats a hog on size 16 BWO. And I got a free extrafly this guy collected from some frustrated soul. Only pic my buddy could get .... sorry for the quality. Yes it a pure cutty. Looks like a nice way to enjoy the day, part of the dream is just being there. I'd take a day on that creek over hunting everyday of the week. Looks sooo inviting. Beauty spot you found there. I could spend the day there and not catch a thing and still come home satisfied. 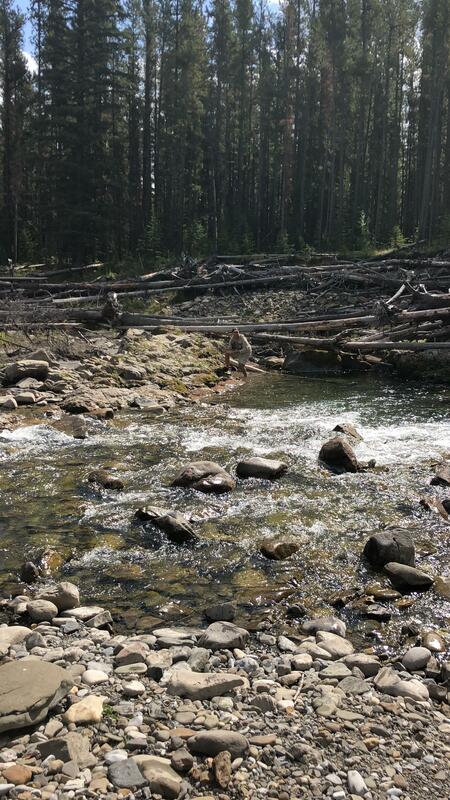 At the exact same spot, last year, I lost my fly line to a bull trout. Hooked her with a streamer, and then she went around the big logs at the lower pool and my lines got tangled underwater at the very deep pretty badly. watched the bull trout got off the hook and swim away, which is good. But i think my line is still down deep in that pool on the logs.